The X-51A WaveRider (Credits: US Air Force). On Tuesday, August 14, a much-hyped hypersonic test flight of the US Air Force X-51A WaveRider went south when the craft suffered a fault with one of its control fins and crashed in the Pacific Ocean. “All our data showed we had created the right conditions for engine ignition and we were very hopeful to meet our test objectives,” said Charlie Brink of the Air Force Research Lab. No theory has been put forward as to the cause of the control loss in a system that has given no prior indication of malfunction. 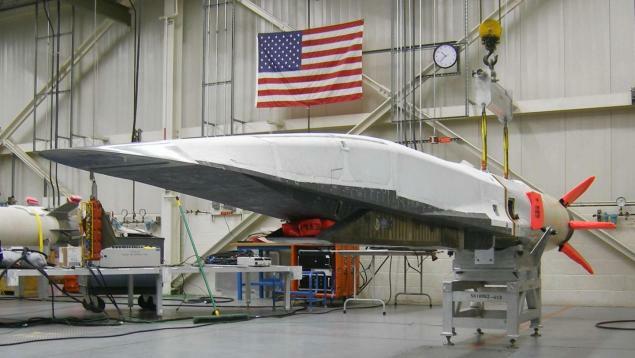 This was the third test of the Boeing-developed X-51A. A 2010 test flight successfully achieved Mach 5 for 140 seconds. A second test in 2011 ended up in the Pacific without achieving hypersonic speeds when the WaveRider was unable to restart its engine. One prototype of the craft remains, although there is no word yet on whether or when a fourth test flight might be scheduled. The X-51A WaveRider is so called because its scramjet engine, which uses atmospheric oxygen to oxidize its onboard fuel, is designed to ride its own shockwave. The craft is dropped from a B-52 bomber, accelerated to Mach 4.5 by a rocket booster, then the scramjet kicks in, accelerating the plane to about Mach 6. At least that’s the theory – to-date no prototype has reached that speed. A flight is only designated hypersonic when it exceeds Mach 5. Hypersonic technology is seen as the next step in flight systems and is keenly sought by militaries for use as stealth aircraft and for speedy missile delivery to targets around the world. The WaveRider is a US military project, but is also partially funded by NASA. Although there is much talk of potential for a crewed hypersonic craft, that eventuallity seems far in the future. The only commercial supersonic passenger jet ever developed, the Concorde, was retired in 2003 when it was unable to achieve commercial success following a combination of a 2000 fatal crash and the reduced air traffic that resulted from the 2001 New York terrorist attacks. The fastest passenger plane in use today is the Mach 0.9 Cessna Citation X which carries 7 passengers.